August 29 (1941) is Robin Leach's Birthday. So today we celebrate the extravagances in our lives. 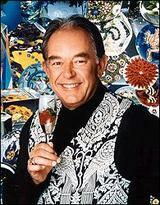 For me, Robin Leach is the voice of the 80's. His show "Lifestyles of the Rich & Famous" was a precursor to all the MTV style Cribs type shows. The big difference is that he did it in style. Even today when I am writing an article about some extravagance it is hard for me to re-read it in my head without hearing it being read in a Robin Leach accent. Besides being a great voice and the host of the show that I watched along with the Love Boat in the 1980's, Robin was also a very good interviewer. You wouldn't always know it because he made it look easy. But getting a great story, even about the rich and famous is not always as easy as it looks. "When I interview people, and they give me an immediate answer, they're often not thinking . So I'm silent. I wait. Because they think they have to keep answering. And it's the second train of thought that's the better answer." This is one of my favorite quotes from Robin Leach and it is sooo true. It seems only appropriate that on Robin Leach's birthday one of the big headlines of the day was about a $290 paper bag. CLICK HERE for the full story. What are the inflation proof items in your life? TP - I like Charmin. The kids finally noticed that there is always Charmin TP in my bathroom - although on occasion the super saver brand makes its way to the upstairs bathroom. Coffee - I like coffee. 25 years ago we were given a Braun coffee grinder as a wedding gift and it is still going strong. Internet - I like being able to work from anywhere. I would love to have Google Fiber and then I would truly feel like I was living the lifestyles of the rich and famous. But right now I just pay for Internet to come into my house and on to my phone. Really that is about it. Everything else can be negotiated. With kids running around its not always easy to live a lifestyle of the rich and famous. But when I do want to live that lifestyle (even just vicariously) I go to Travelingmom.com and read the latest post from Luxury Traveling Mom Kim-Marie. She always sweeps me away to some exotic location AND she does this with her kids! CLICK HERE to read Luxury Travelingmom's article on Bal Harbour. Here is to all of our Champagne Wishes and Caviar Dreams.